There is some really great fried rice in Thailand, not greasy, served with pork, chicken or crab. I never liked fried rice, most of the fried rice I ate in America was heavy and oily, possibly the first great fried rice I had was in Taiwan. But, I never associated Thai food with fried rice and somehow got the notion that eating fried rice in Thailand was for those people that couldn’t handle real, authentic Thai food. ข้าวผัด (fried rice) isn’t for those that ‘quit’ on ”real’ Thai food. 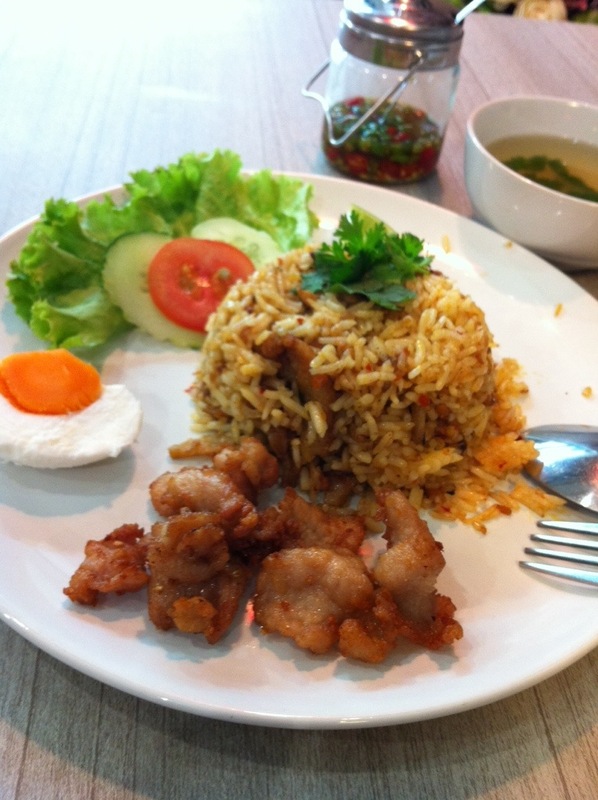 Fried rice with crab is something loved by Thais and fried rice with pork is eaten by many Thais on a regular basis. Today I had a great fried rice, it came with half a salted egg and fried pork, cooked quickly in an old looking wok, it had loads of flavor, was light and not oily and made for a perfect lunch. Now that I have finally banished the ‘Thai fried rice is for quitters’ thoughts, this will become a regular meal for me. This entry was posted in Food & Restaurants, photographs and tagged Thai Fried Rice. Bookmark the permalink.